We utilize acrylic fiber technologies in three core areas to develop various products—polymerization, chemical denaturation and fiber formation. 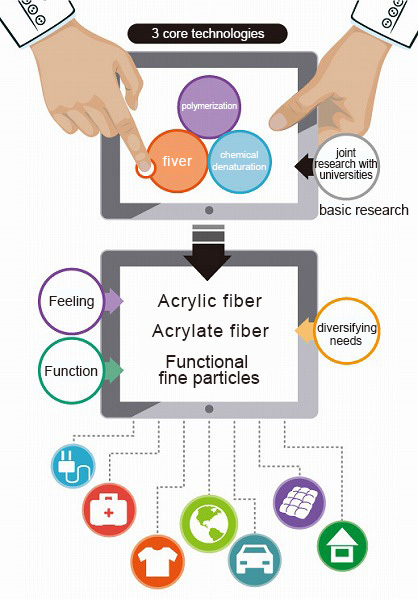 In recent years, customers’ needs have been diversifying, generating the need for fibers with better feel (kansei) and functionality. We answer those needs by constantly advancing our three core technologies and creating new products. Beyond acrylic fibers, we utilize this technological expertise in research and development and the manufacturing of functional fibers and functional fine particles such as acrylate fibers. The markets for our products have expanded beyond clothing to a range of fields including medical, automotive, building materials, environmental conservation and energy conservation. Our products are basic materials that quietly support these fields.We also focus on basic research, including joint research with universities, and we present results of our research at various academic conferences and seminars.Our technologies have unlimited potential, and we are pursuing research to develop new applications for the future.